Boxford Historical Society was formed in 1937 by a group of Boxford residents that included Harry L. Cole, Mary Abbie Herrick, Raymond Perley and Robert B. Parkhurst as board members. There were also 210 charter members of the society at the first meeting in December that year. 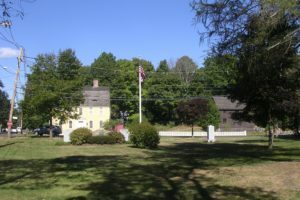 At that time, the mission of the society was “to preserve letters, documents, household articles and personal memories of the old homes and families and to promote interest in the town by recording information about families, industrial life and all items pertaining to the history of the town.” The mission also required that the Boxford Historical Society preserve a “historic dwelling” which was to be used by the society to hold meetings. The first home of the society was the old Bacon Lilbrary building on Elm Street however, in 1941 Gertrude Holyoke gifted her home on Topsfield Road to the organization after her death. The home was in disrepair which prompted the society to launch fundraising campaigns that included colonial costume balls, a historical pageant and several auctions. The money raised from these events and the annual dues that was collected from members allowed the society to restore the interior of the home. The care and preservation of the Holyoke-French house continues to be an important part of the mission of the Boxford Historical Society. The society continues many activities annually including the Harbinger of Spring Party, refreshments at the July 4th parade, December’s Grand Illumination, and the reknown annual Boxford Apple Festival.